Maybe you are unsure that you like the default font choice that each browser would use to render your web page. 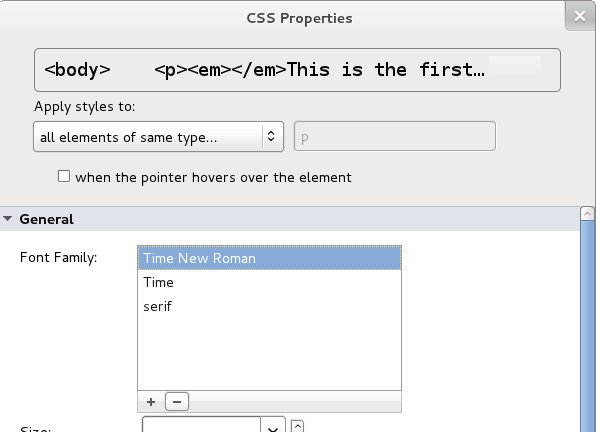 You can select a cheesier font by Edit, Select All, and then expanding the General item in the CSS Properties dialogue. By selecting the + sign at the bottom of the Font Family: textbox, you can see a list of fonts which are available on your system. 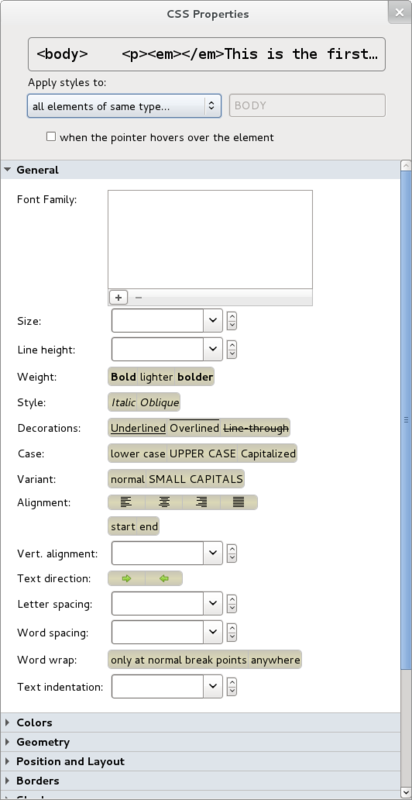 While the first few choices are general descriptors for fonts that should be available on any computer system, the later choices may include fonts which would be found on few other computers than yours. Since you would like to influence the appearance of your web page when it is displayed on any system connected to the web, rather than merely devices which happen to be running the same operating system that you do, etc. it will rarely be wise to select specific fonts from the bottom portion of this list. For the moment, select a different font. If your web page was being displayed with e.g. "Arial, Helvetica, sans-serif" choose the "Time New Roman, Time, serif" [sic] font. As usual, you will notice that this change is effective immediately in the BlueGriffon window, even before you close the CSS Properties dialog. 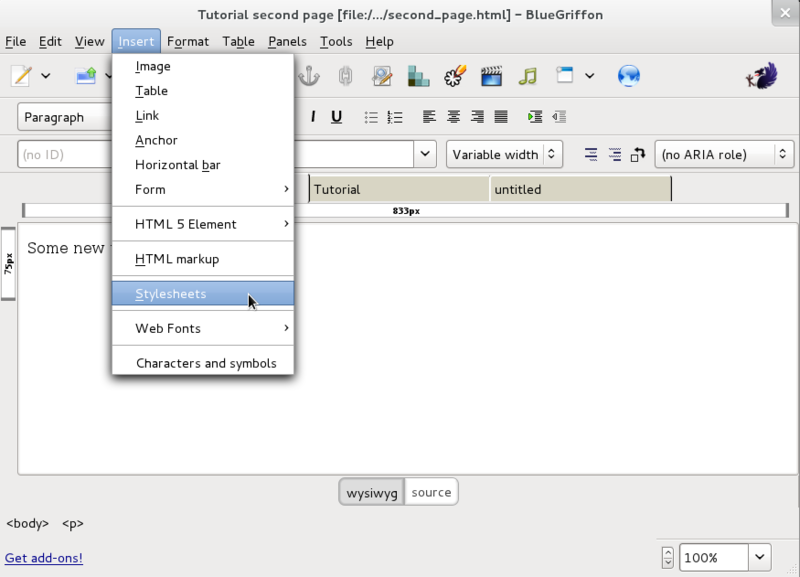 Remember that much earlier in this tutorial you created another page? You may even still have it open in another tab within your BlueGriffon window. Select it to view it once more. 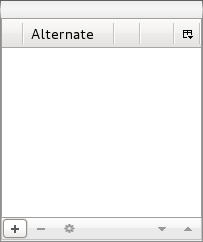 While its content is still quite brief, you will notice that it is still rendered with the default font, rather than the one you just selected for the main page. Rather than creating a group of web pages which resemble a ransom note, with different fonts, etc. would not it be nice to make style changes in one place which affect all of the pages? editing one centralized .css file (which is included in each of the e.g. 179 .html files via an @import rule or an HTML link) to make these changes once in an external style sheet? First, you need to clear the embedded style rule that you created a little while ago. 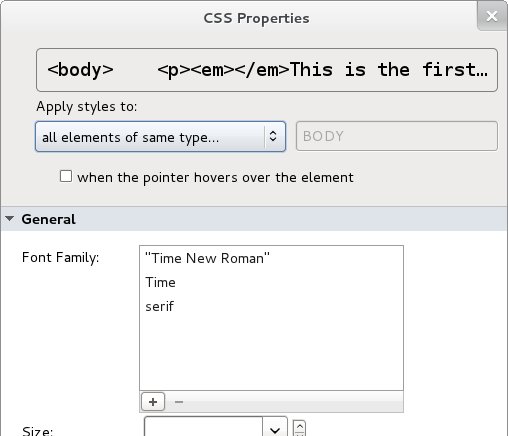 In the CSS Properties, General section, within the Font Family textbox select one of the lines and then select the "-" sign to delete that font specification. then select the + sign at the lower left of the resulting anonymous dialogue. In the resulting dialogue, select the radio button for Linked to the document, and then select the New file command button. Save this file (e.g. by selecting the 3rd icon from the left on BlueGriffon's icon bar). 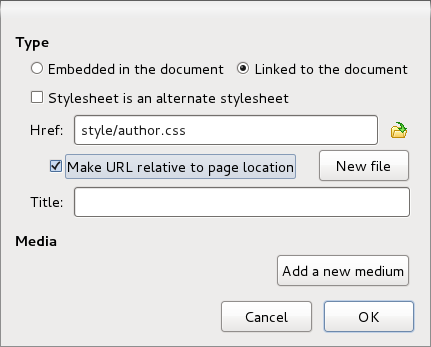 It is not until you Save the file after making style choices that any (or changed) content is written to the external style sheet in .../Tutorial_Site/style/author.css. again select the + sign at the lower left of the resulting anonymous dialogue. 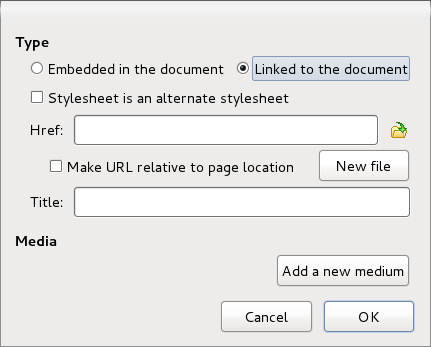 In the resulting dialogue, select the radio button for Linked to the document, and then select the Select a stylesheet file icon. select the Open command button. Now Save the second_page.html file again, and notice how its font now matches the font in index.html ... even though you never made a font choice while editing the second page. You have just witnessed a tiny example of the power of using external stylesheets. once again the amount of data to be fetched by the web server, transmitted over the communication network, and processed by a web browser is reduced, which should reduce the response time delay that your impatient users will experience.